As a follow up to my previous post regarding the removed permanent link on my GMT II. Here are some pix. As you will notice, now there are only 4 links on the 6 o'clock side. I must say that it now sits more centered and feels much more comfortable on my wrist. You will also see that the steps between the fixed and last removable links are not really noticable. "Where no counsel is the people fall, but in the multitude of counselors there is safety." Great work also. Who did the work? Why have what's new when you have what's best. I bet they have a special pliers just for this. Man I want this done so my GF can wear my sub. I need another bracelet. Looks great! Glad you're happy with it! Looks Good. How much did they charge? I'm guessing you won't be able to put the link back on? Was it destroyed? That is correct. Once a permanent link is removed, it is damaged and cann't be reused. Good job....although, personally, I'm glad I get the perfect, straight out of box fit and never have to do that to my bracelet!! Wow man that looks really great! I had always wanted that done as well, however when I saw one removed by the SFO RSC it did not look as good, as the step on the last link was very noticable. "Be the change you would like to see in the world." Thanks for the pics. I think the RSC did more than just removing the permanent link. They also polished away the "step". There's a change of "slope" on the 3rd permanent link. Normally, the "slopes" on all permanent links are the same. I think you're right. I was wondering how this could've happened without that "step" between the links, and after looking at it again, it's definitely shaped differently. That may be the case but its hardly noticable unless you look hard. I did not even notice that until you pointed out. For me, its about comfort. If I spend thousands of dollars on a watch, I'd rather have it feel comfortable on my wrist. I do not have the luxury of wearing the watch right out of the box... so I gotta do what feels right for me. We are talking about removing a permanent link, so its aways going to be imperfection whether its uneven steps or a change of slope or whatever the case may be. In my book, the RSC did a great job of hiding the uneven steps. Yeah, it may be obvious to us....WISs.... but its good enough for me. "If the game is rigged, you can't lose if you don't play." Member of NAWCC since 1990. I think the RSC did a great job too. I'm procastinating on the permanent link removal as I think the step will bug me. Now with the step polished away .... hmm.... it looks much bettter ..... I'm one step closer to removing the permanent link. When I decide to have it done, i'll want it to be done like what has been done to yours. I think we have about the same wrist size. Mine is slightly larger than 6" but not by much though. If you are close to RSC BH, I recommend giving them a chance. I'm EXTREMELY tempted to have this link removed now that your pics look great. I have some concern that it won't turn out as well as yours did, though. I don't plan on ever selling my Expy, but if this doesn't fit perfectly, it won't be worth it. I just used the tape measure and it came out to be slightly under 6-1/4". I would say that you should not have any problem at all with one link removed. 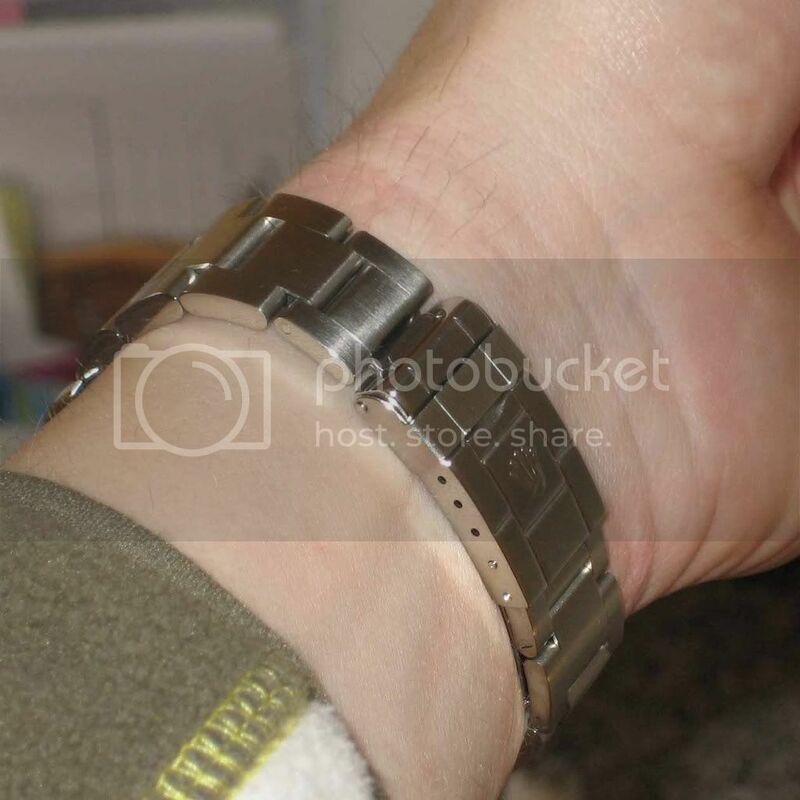 Keep in mind that you can always adjust the bracelet on the 12 o'clock side to make it fit perfectly. Looks great. Here is a picture - as reference. I posted it the other day on the same topic - permanent link removal. It could be interesting to compare the result. I have exactly the same layout on my bracelet (same bracelet, but an Explorer II). But I have not polished the last fixed link, so there is still a small gap. I measured it to be 0.5 mm on each side. RSC seems to have done a great job on your bracelet, and it makes me wonder if I should not have my bracelets (yes, several) polished in the same manner, to remove the visual gap. The fit is quite tight on my wrist, and I like it like that, and I find it to be perfect. On older oyster bracelets where some stretch has occured the removal of a fixed link becomes even more important for a good fit. I measured my wrist, its about 6.5 inches, a bit smaller if cold, a bit bigger if warm. After seeing this, I am curious. I feel like I barely, and I mean barely get away with watches of this size on my 6.75" wrist without them looking huge. You guys with smaller wrist have any pics....wrist shots I mean?? Me too JJ, I have a Rolex wrist! "People sleep safely in their beds at night because rough men stand ready to do violence on their behalf."